Ms. Brucie was born and raised in Corning, New York. A graduate of Syracuse University, Ms. Brucie earned a Bachelor of Arts Degree from Loyola University of Maryland and graduated from Corning East Highschool, New York. 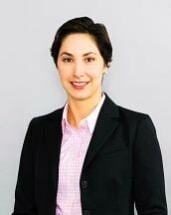 Ms. Brucie concentrates her practice in the areas of Civil Litigation, Commercial Litigation and Family Law. She represents individuals and small businesses in a variety of civil matters and has significant litigation experience in the Court of Common Pleas of Pennsylvania, including Bucks and Montgomery Counties. Ms. Brucie is dedicated to reaching the most economical and best possible outcome for her clients. In her free time Ms. Brucie volunteers as a coach with Girls on the Run, which is a running group that works to bolster self-esteem, self-image and provides a safe platform and tools for navigating social issues that young girls face. She also volunteers with all of her three daughters activities, which include lacrosse, swimming, cross-country and dance. In addition, she organizes a community running group that works to familiarize neighbors with local issues.